Wednesday, January 23, 2019 by: Isabelle Z. 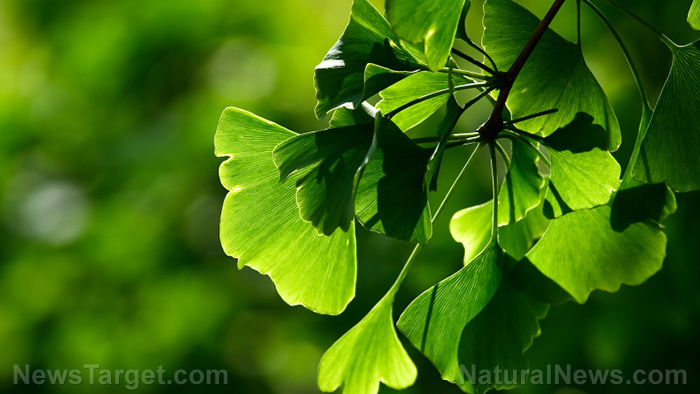 (Natural News) The ginkgo biloba tree might not give off the most pleasant smell, but hiding beneath its rancid odor is the power to heal more than 100 different diseases. Referred to as a “living fossil” because it lacks close living relatives, the species can trace its roots back to the age of dinosaurs more than 270 million years ago. Let’s take a look at some of this powerful tree’s most useful benefits. A ginkgo tree can live for as long as 1,000 years, so it’s not surprising that it can enhance your longevity in some ways, too. Its leaves have been used in Chinese medicine since at least 2800 B.C., but one of its most important modern uses is in enhancing cognition to fight dementia and Alzheimer’s Disease. A meta analysis of nine trials revealed that a standardized Ginkgo biloba extract is more effective than a placebo in improving the cognition of people suffering from dementia and Alzheimer’s disease while also improving their daily life activities. In fact, the researchers believe it could be just as good – if not better – than other current dementia treatment options. Another meta analysis involving 21 trials found that it could improve thinking in those with mild cognitive impairment, and it enhanced the efficacy of conventional drugs. Meanwhile, a different meta analysis revealed that taking 249 milligrams of Ginkgo biloba extract daily was enough to slow cognitive decline. What makes it particularly attractive for helping those with cognition problems is that, unlike conventional medication, it is quite safe. Studies comparing the herb with donepezil, a common Alzheimer’s medication, found that although all three groups – ginkgo biloba only, donepezil only, and ginkgo biloba plus donepezil – noted similar improvements, the rate of adverse events was significantly higher in those taking the drug versus the herb. Anyone who has ever had a migraine can tell you how stubborn they can be, but it looks like ginkgo biloba is one of their weak spots. An Italian study found that the ginkgo biloba constituent Ginkgolide B reduced the frequency of migraines as well as the need for migraine medication. A different study, meanwhile, found that taking 60 milligrams of ginkgo biloba two times a day over the course of four months reduced patients’ average number of migraines by more than half – going from 3.7 to 1.2 on average – and slashed the length of migraines from 40 minutes down to just 17.6 minutes. A meta analysis revealed that ginkgo biloba has the power to improve the symptoms of tardive dyskinesia seen in patients with schizophrenia. This is a severe side effect that is often experienced by those taking anti-psychotic drugs for schizophrenia and is characterized by jaw swinging, finger movements, facial grimacing, tongue thrusting, and repetitive chewing. It’s believed that the herb’s high levels of antioxidants could be responsible for this effect. One study of children with attention deficit hyperactivity disorder found that taking ginkgo biloba significantly improved attention, while a different, small study found that ginkgo biloba could improve inattention, hyperactivity and immaturity. Ginkgo biloba has been found to improve the pain-free walking time for people suffering from painful blockages or narrowing in the arteries of their legs. The crampy leg pain, which is known as intermittent claudication, is often felt during walking and other exercise and can be severely limiting. One study showed that those taking ginkgo were able to walk a further 41 meters. There are plenty more conditions that can benefit from this herb, and they range from glaucoma and tinnitus to vitiligo and stroke recovery. Why use modern drugs whose long-term effects we don’t yet know when there are natural treatments that have stood the test of time for thousands of years?